Rendering of the Istanbul New Airport. Courtesy iGA. How did some of the most prominent airports in the world fall behind? What makes some airport designs and travel experiences better than others? Here, design teams behind the expansion of four of the largest international airports—Los Angeles International Airport, Istanbul New Airport, Hong Kong International Airport, and LaGuardia Airport—explain what improvements they are making, how they’re using technology to inform their airport design decisions, and what it takes to create a modern travel experience for a growing global population. MSC North Concourse. Courtesy Corgan in Association with Gensler. The Los Angeles International Airport (LAX) in Southern California is the largest and busiest airport on the U.S. West Coast, and it’s been notorious for congestion surrounding the area. Prior to its recent reconstruction projects, the airport’s overall design and travel experience did not reflect its position as a key aviation hub. According to Tim Sullivan, Senior Project Manager Aviation at architecture firm Gensler, LAX upgrades were previously neglected because of adversarial relationships among the airport, airlines, and neighborhood. 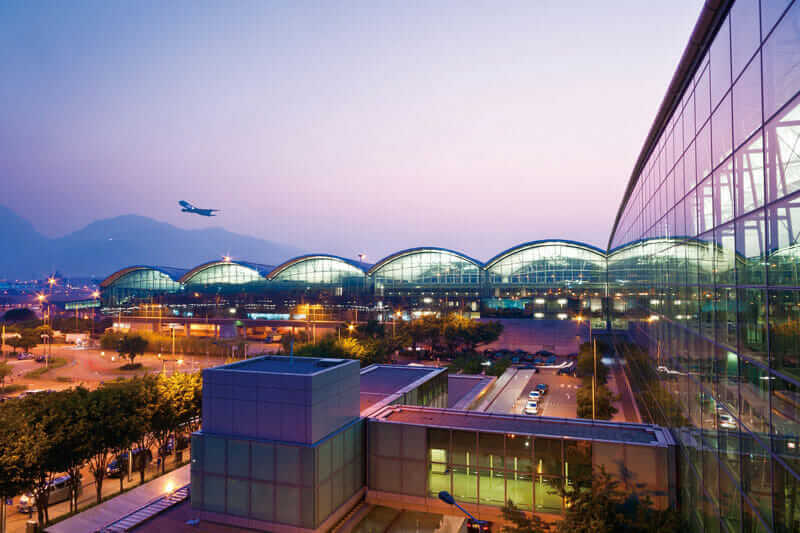 In 2010, modernization efforts for the Tom Bradley International Terminal began. The Los Angeles mayor at the time, Antonio Villaraigosa, emphasized improving the passenger experience and keeping Los Angeles competitive with other global cities. In total, the LAX modernization program will cost $14 billion through 2023 and also includes the Midfield Satellite Concourse (featuring 12 new aircraft gates), renovations to several terminals, and the Landside Access Modernization Program. 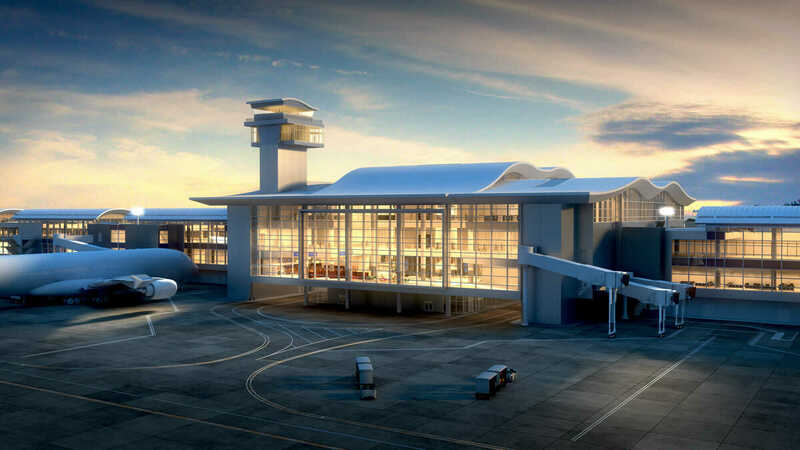 Meanwhile, Gensler architects used virtual reality and BIM (with Autodesk Revit) to educate clients—such as the airport authority and local government—about the project and immerse them into the 3D space. Rendering of Istanbul New Airport interior. Courtesy iGA. 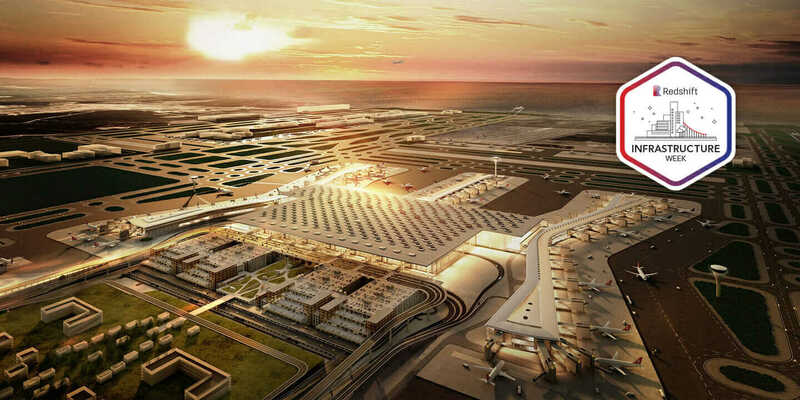 Digital transformation is also a fundamental benchmark for the Istanbul New Airport—the world’s largest airport project (and finalist in the 2016 and 2017 AEC Excellence Awards). The project, designed by iGA (which has a 25-year contract to construct and operate the airport), will occur in four phases, the first to be completed by early 2018. 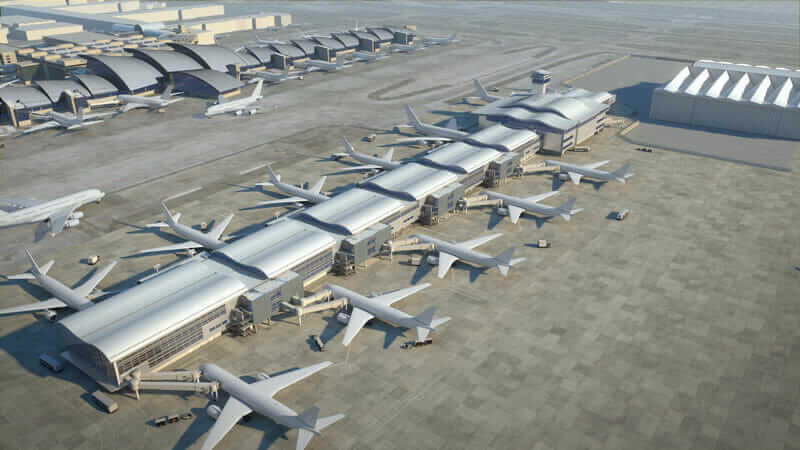 By the end of phase one, it will feature two independent runways, a 1.3-million-square-meter (14-million-square-foot) terminal, a 700,000-square-meter (7.5-million-square-foot) parking lot, 143 passenger-boarding bridges, all necessary airport support facilities, and capacity of 90 million passengers per year. By the project’s completion in 2028, there will be six runways, multiple facilities (including hospitals, hotels, and convention centers), room for 3,500 takeoffs and landings per day, and capacity of 200 million passengers per year. But it’s not so easy to pull off. 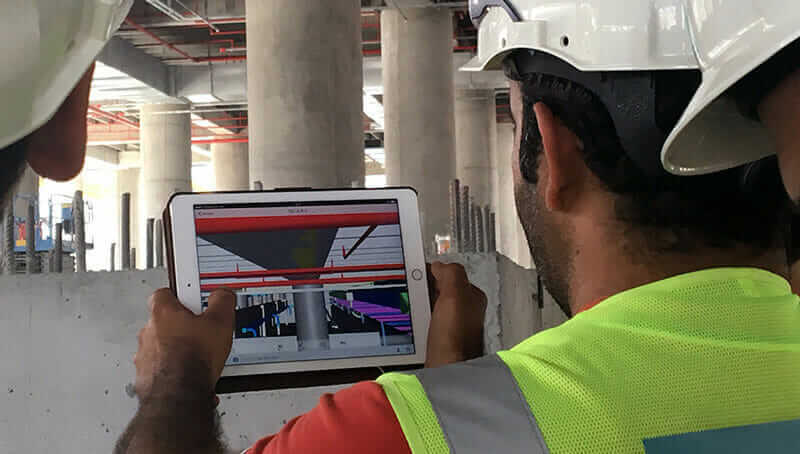 Engineers reference the BIM model on an iPad at the Istanbul New Airport site. Courtesy iGA. 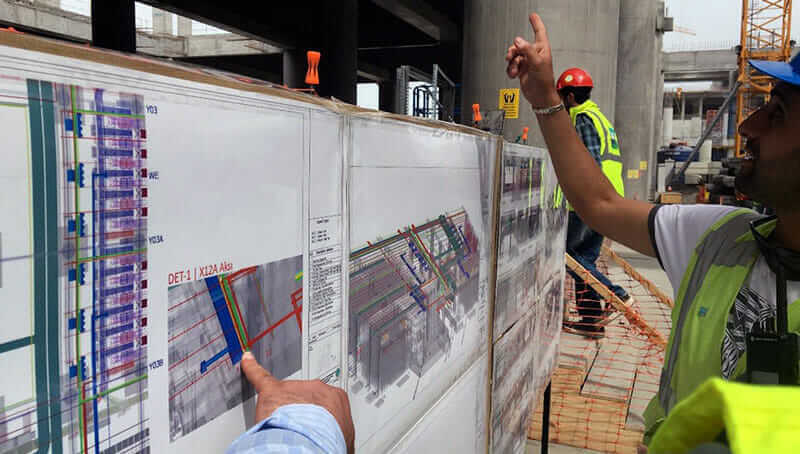 Engineers reference the Istanbul New Airport model on-site. Courtesy iGA. The BIM model of the Istanbul New Airport. Courtesy iGA. Using BIM in the cloud (specifically BIM 360) has had a major impact on project efficiency. Daily activity and QA/QC processes are monitored and executed by site engineers accessing coordinated 3D BIM models on iPads (150 total). 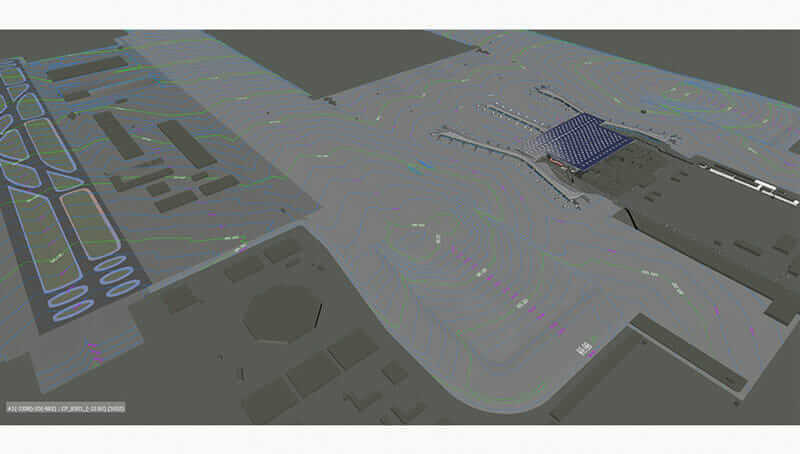 But the BIM process continues even after the airport is built. An aerial view of Hong Kong International Airport. Courtesy HKIA. 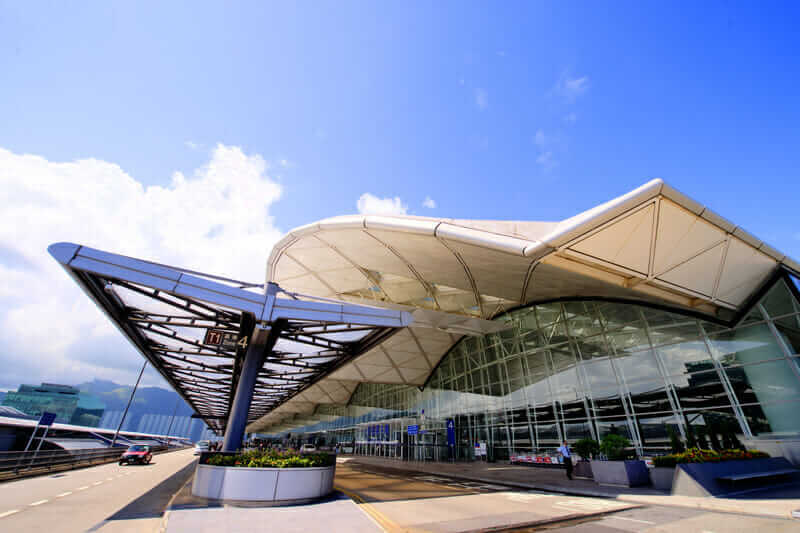 Istanbul may stake its claim as the largest airport project, but Hong Kong International Airport (HKIA) is aiming to be the greenest with help from engineering firm AECOM. Sustainable features include maximizing natural light, energy reduction, solar panels on the roof, and even an offshore designated marine park (a commitment from the Airport Authority Hong Kong for Chinese white dolphin conservation). 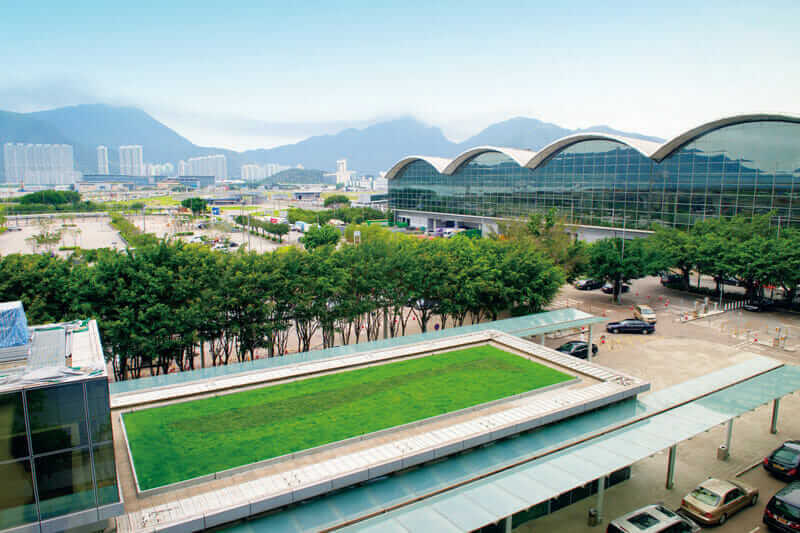 Hong Kong International Airport's green rooftop. Courtesy HKIA. 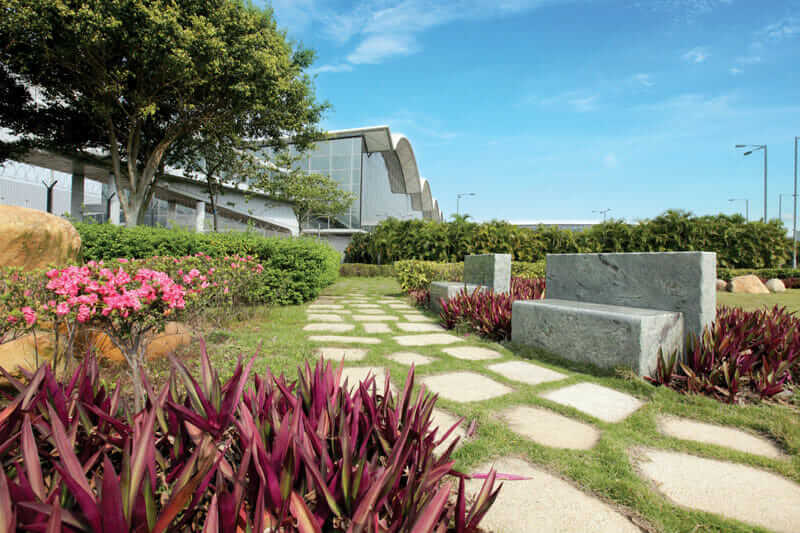 Hong Kong International Airport's sustainable design on display. Courtesy HKIA. Hong Kong International Airport Terminal 1 exterior. Courtesy HKIA. Hong Kong International Airport Terminal 1 interior. Courtesy HKIA. Hong Kong International Airport Terminal 2 interior. Courtesy HKIA. 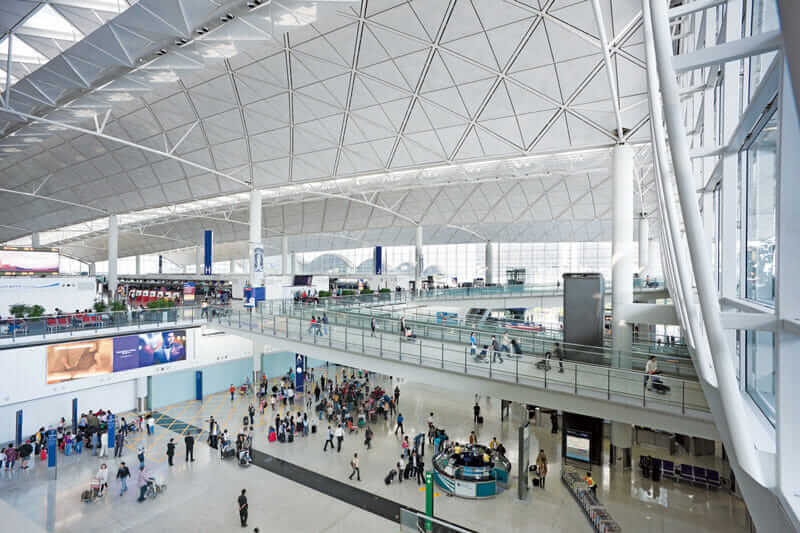 Given the complexities of rebuilding the airport, Kong says she was particularly impressed by the attention to detail in facilities management. For example, AECOM had to consider how passenger carry-ons would be efficiently screened at the security checkpoint. LaGuardia expansion rendering. Courtesy WSP. 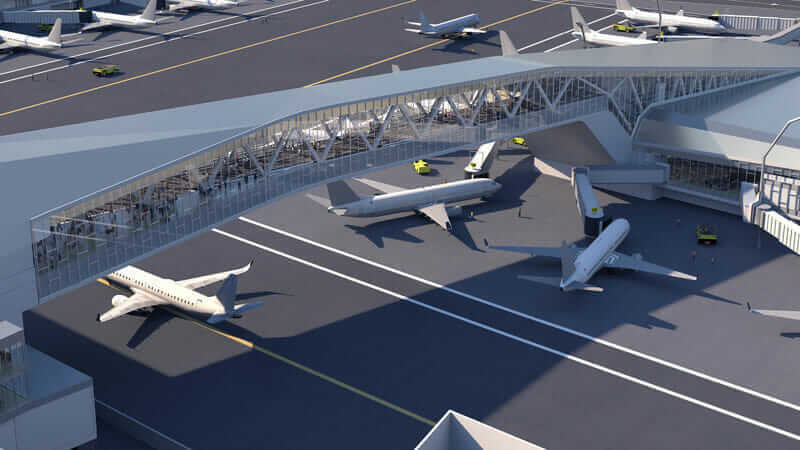 For the stakeholders working on LaGuardia Airport in New York, BIM helps designers, owners, and managers see the building in multiple dimensions—and also serves as a risk-mitigation tool. In July 2015, New York Governor Andrew Cuomo joined with then-Vice President Joe Biden (who once called LaGuardia’s Terminal B a “third-world country”) to announce a $4 billion plan that would rebuild the terminals as one contiguous building with terminal bridges connecting buildings. 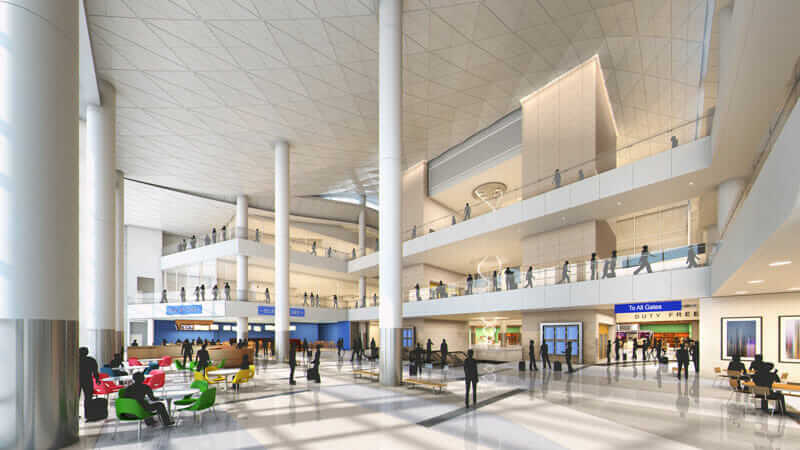 Cuomo said he wanted LaGuardia to feature the world’s best airport design, which meant using the most advanced technology to improve public transportation to the airport, reduce flight delays, and cut down on traffic surrounding the airport. 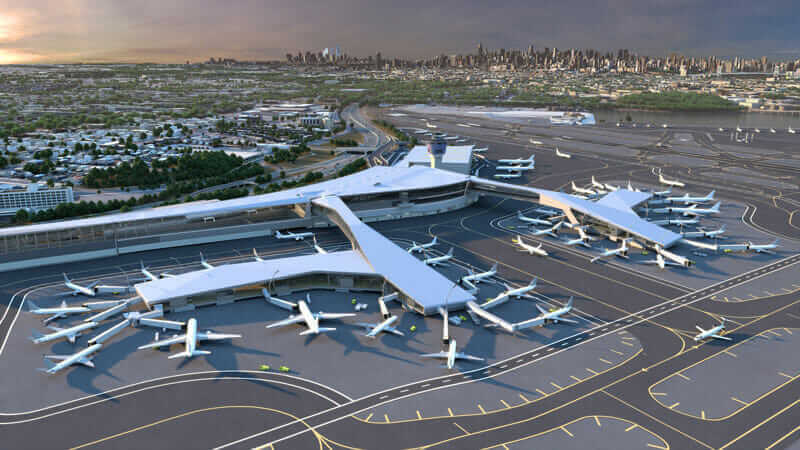 LaGuardia expansion rendering. Courtesy WSP. 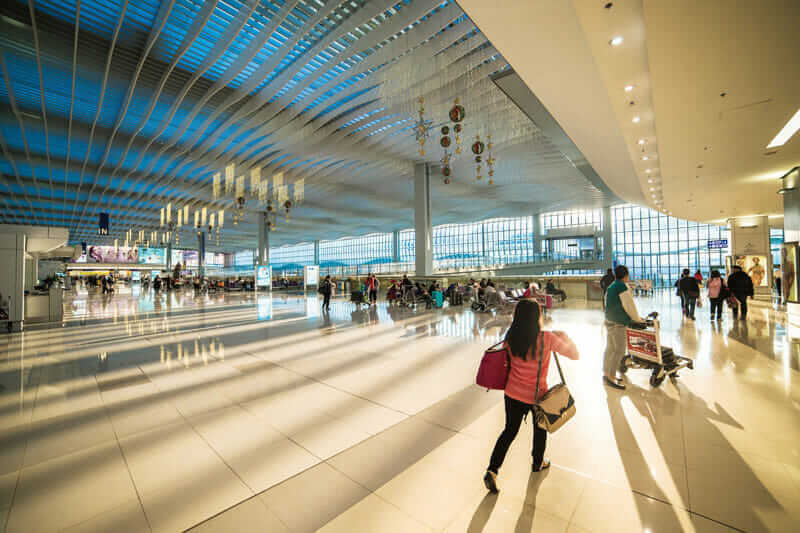 In order to create the best, most modern travel experience, the WSP team designed a new terminal that would be light and airy, as opposed to the dark, low ceilings of the existing terminals. The team also designed new bridges and concourses.